Scroll down to view past events that SLCE has hosted or participated in. 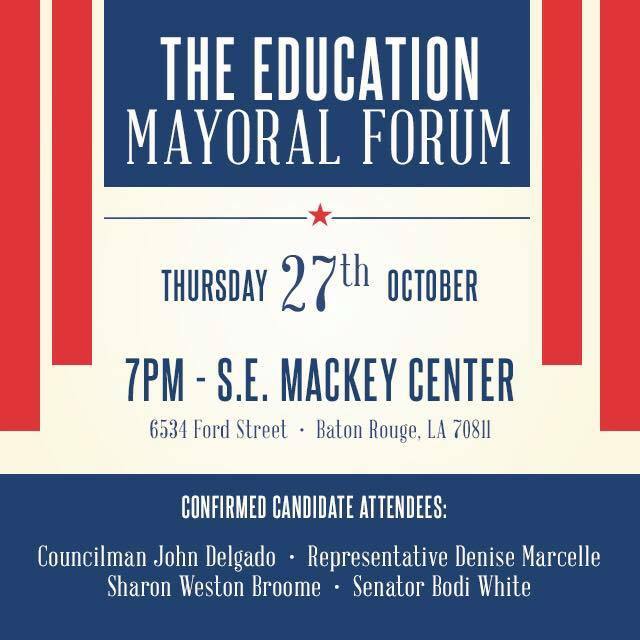 In October 2016, SLCE hosted the 4 candidates for East Baton Rouge Mayor-President at a forum to discuss their vision for the city and its impact on local educational issues. In March 2016, SLCE hosted 3 of our local State Representatives to discuss the intersection of local education policy and the state legislature. In March 2017, SLCE met with Mayor Sharon Weston-Broome to discuss her policy agenda and vision for the future of education across the City-Parish of East Baton Rouge. 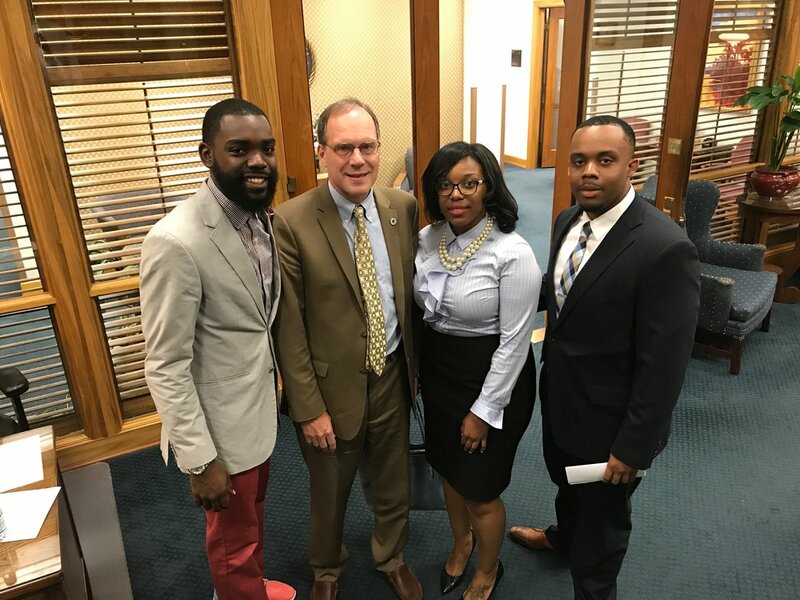 In April 2017, SLCE hosted 3 members of the East Baton Rouge Metro Council to discuss the ways in which their work on the Metro Council intersects with, and impacts, local education. In May 2017, members of SLCE testified in support of HB79, a key bill that would ban the use of corporal punishment against students with disabilities across the entire state of Louisiana. SLCE members were the only teachers to testify before the committee in support of the bill, which would go on to pass the House and the Senate and be signed into law by Governor John Bel Edwards. In May 2017, SLCE hosted a discussion with educators, students, and community members to reflect on the death of Alton Sterling and its implications for Baton Rouge as a city. On August 28th, SLCE welcomed members of the East Baton Rouge Parish School Board and BESE Board, as well as nearly 50 community members, to our latest installment of the Education Conversation series. At this installment, we discussed the relationship between BESE and the EBR School Board, how the governance and policies of these two institutions affect the education of students in local public schools, and how we can get more involved with both of these elected bodies. 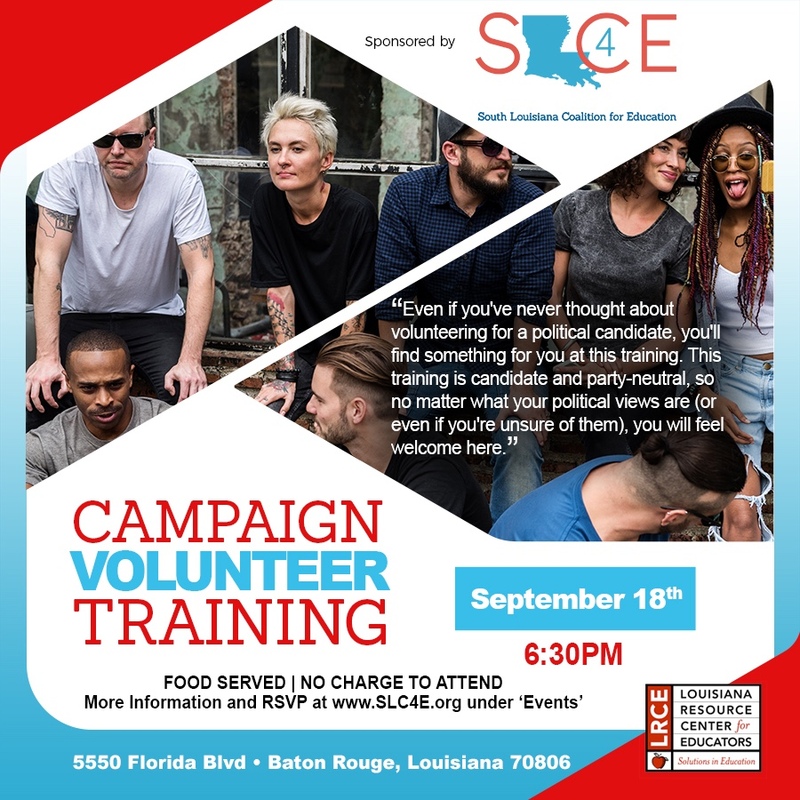 On September 18th, 2017, SLCE hosted a Campaign Volunteer Training for community members at the Louisiana Resource Center for Educators. Participants in the workshop ranged from current political campaign volunteers to those with no prior expertise or background in campaign work. Participants in the training were able to spend time researching the different candidates for EBR School Board, forming their opinions on whom they might like to support, and learning about the theory and efficacy of direct voter contact work. Participants were then able to script their messaging for canvassing, and actually practice application of their new skills through role play of canvassing conversations on the door. On September 25th, 2017 at Lee Magnet High School, SLCE hosted the three candidates for the District 7 School Board seat in East Baton Rouge Parish Public Schools. Candidates answered a series of questions related to the most widely and deeply-felt issues we surfaced through community organizing work across District 7. Candidates were asked if they would commit to fixing the issues, and asked to share specific policy points for each issue area, before an audience of District 7 voters. All 3 candidates committed to working on all 6 issues, and shared their varying policy visions for each community issue. After the Forum, audience members shared lingering written questions, which candidates were given the opportunity to answer. Their answers, as well as the transcript of moderator questions, are linked below. To view the Forum Agenda with Moderator Questions, click here. To view the Candidates' Written Responses to Audience Members' Follow-Up Questions, click here. On October 28th at LRCE, dozens of community members from across the South Louisiana region joined SLCE as we discussed and debated the issues that we had surfaced throughout the year during individual meetings and House Meetings. With the help of these community members, we were able to vote and decide on the 3 major problems that we will focus on in the coming year: Special Education in Culturally Relevant Schools, School Board Accessibility, and Equitable Funding. With the help of our Issue Action Teams, we will spend the coming months researching how to move from problem, to issue, to action on these three major challenges facing education in our state. Stay tuned to see what we are able to accomplish! On November 16th, SLCE hosted our first Sip & Chat Education Mixer at Blend Wine Bar in Baton Rouge. This event gave us a chance to come together as a community and discuss issues facing education in a relaxed, engaging atmosphere, while continuing our work of surfacing educational issues across the region and brainstorming possible solutions to our selected issues for the coming year. The event was a great success, with good turnout and high engagement among attendees. We look forward to hosting additional Education Mixers in the months to come!